In the last few years many of the tech big-hitters have rolled out a digital assistant, making it easier for users to find information, play media, consult calendars and set reminders, all without using their hands. Apple has Siri, Google has Google Now, Microsoft has Cortana and, in late 2014, Amazon introduced us to Alexa, its own voice-controlled, cloud-based platform. Rather than place it within a Fire-branded product, Amazon has given Alexa her very own, self-contained device; the multi-skilled Amazon Echo. As such, the freestanding speaker is designed to be a hands-free aid to the whole family, rather than a bonus feature on a personal mobile device. Now on general sale in the United States, here's everything we know about the Amazon Echo speaker. Amazon announced the Echo speaker in November 2014, opening it up to a limited number of Prime Members in the United States for the introductory price of $99 (around £60). In mid-July it became available to all customers for $180 (around £116), shipping out from mid-July. The company is yet to announce pricing and availability outside of the US. The cylindrical Amazon Echo unit, which is 9.25-inches tall, comprises of two major components, the 360-degree speaker unit itself and the multi-directional microphones on top. The omni-directional 'room filling' speaker has a 2.5-inch woofer and a two-inch tweeter, which can be used for anything from pumping out your favourite Prime Music playlists to reading out weather reports and answering questions. The Echo is also fitted with seven microphones situated around the top of the device, meaning it will hear your commands regardless of where you are in the room. Amazon calls it 'far field voice recognition.' Thanks to enhanced noise reduction tech, it will be able to hear a question asked even when it is playing music too. Nice. If you don't want 'Alexa' (more on her later) listening in on everything you say, there's a microphone off button. There's also a button that can be used to activate her instead of the 'wake' word. Meanwhile, the light-ring will change colour to signify which microphone is picking up the sound. 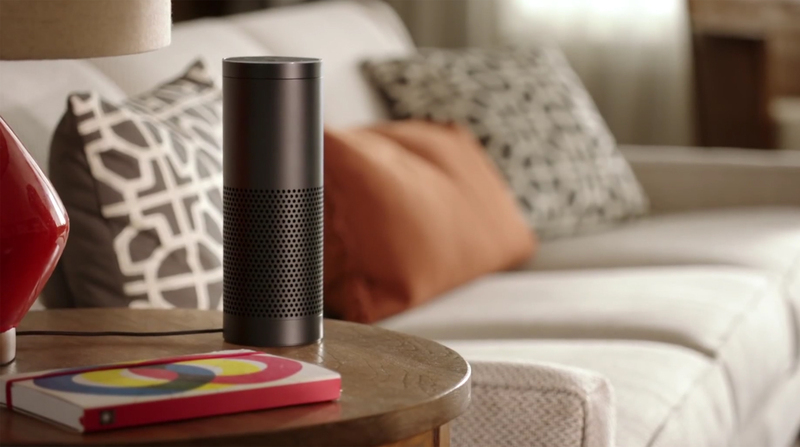 In terms of connectivity, the 1045g Echo is fitted with Wi-Fi (802.11a/b/g/n, dual-band, dual-antenna) and Bluetooth for web connectivity, streaming from other devices and interactivity with other pieces of smart home tech. While other portable speakers can run on batteries, Echo must be plugged into the mains. As the always-listening approach requires at least a little bit of constant power, this helps Alexa always be at your beck and call. Amazon's interpretation of the voice-controlled personal assistant Alexa is the first to get a dedicated piece of hardware. One early review claimed it "may be the closest thing we'll have to a Star Trek computer at home." Rather than listening through every conversation, Alexa is dormant until she hears a wake word (which is 'Alexa' or 'Amazon' with custom wake words coming in the future). The Echo will then begin streaming the audio to the cloud, indicated by the light ring turning blue. From there, you'll be able to ask her to perform any number of tasks and she will respond in kind. Amazon says Alexa will learn to serve you better the more often she is put to use. It'll learn your speech patterns, vocabulary and preferences, while the cloud-based approach always means it'll be able to deliver the latest updates from Amazon, which have been numerous even in the short time the Echo has been available. Amazon Echo: What can Alexa do? Alexa is the brain behind the Amazon Echo, and just like her rivals, she's a fountain of knowledge. Ask her a question and she'll consult sources like Wikipedia. Ask for a traffic update and Nokia HERE Maps will chip in. Weather reports? She'll consult Accuweather. "Start a Weezer Pandora station." – Alexa is connected to the likes of Pandora, NPR, iHeartRadio, Amazon Prime and many more. If a service is not enabled yet, you can use Echo as a Bluetooth speaker anyway. "Wikipedia Kobe Bryant." – This is a new addition that'll read the opening paragraph of Wikipedia pages verbatim. "How many cups in a litre?" – Amazon pitches Echo as an aid for the entire family. So, kids can ask for spellings and definitions when doing homework or parents can request unit conversions when preparing meals. It can even solve 'who sings this song?' Or 'who starred in this movie?' trivia. "Read my book." – Audiobook service Audible is linked to the speaker. "Set my alarm for 7:30am." "Add laundry detergent to my shopping list." – Re-ordering items from your Amazon history is obviously available. If the item is eligible, Alexa will inform you of the list price and ask you to confirm the order. You can also just add stuff to a shopping list. Those who've written-off the Echo as a tool to get you to order more crap from Amazon have cited this functionality. "What's on the calendar for today?" – Google Calendar integration is available and can be configured using the Echo app (see below). "Did the Miami Dolphins win?" – Live sports scores and upcoming schedules were recently added. "How is the weather?" - You can set your postal code and get the current or future forecast. Functionality is also available for cities around the world. "Turn off the lights." – Amazon Echo can play nice with smart home technology including Phillips Hue and Belkin WeMo. "How is traffic today?" – Nokia HERE Maps delivers the goods. This is one of those perfect 'just about to leave the house' features. As Amazon has recently announced an Alexa SDK (plus a $100 million fund for those keen on integrating the functionality), we can expect many more developers and manufacturers to make their apps and devices compatible with the Echo speaker. As we mentioned above, all of these updates will be delivered remotely through the cloud, so there's no waiting for major software bumps. The speaker has a companion app for iOS, Android and Fire devices, in which you can pair up all of the third party services like Pandora, Google Calendar and your Amazon account preferences. You'll also be able to manually manage the alarms, shopping lists, smart home devices and more, while you can also review the speech you're sending to the Echo and provide feedback. Echo.Amazon.com provides the functionality within a web browser too. Amazon has sent us a review unit of the Amazon Echo and we'll be posting a full verdict in the coming weeks. Stay tuned.